How can I deny it? Me, a landscape photographer and lover of the quiet of remote desert and mountain places, yet here I was at a dragstrip with bright orange earplugs in my ears! Maybe I was inspired by my subscription to Road and Track magazine? Anyway, there I was! The throbbing rumbles and screams of the racing motors were viscreal. I could tell that the smells of the racetrack in their own way were part of the experience that one could get to love. The long lines of the varied cars and racing motorcycles waiting patiently for their turns at time trials. 150 mph on motorcycles in the quarter mile was a feat I found most remarkable! Road & Track magazine. Car & Driver magazine. 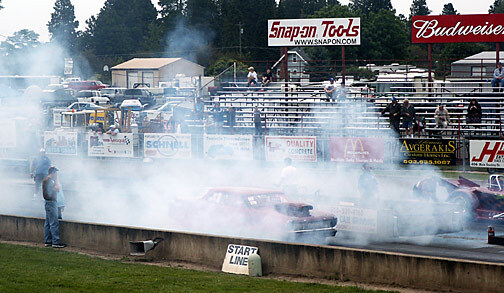 Portland International Raceway is the Upper Willamette Valley's second major racing destination. It is commonly called simply "PIR" (click for link). Below you'll see a link to a daytime picture of the scene shown above-- on a brillant mid-winter day, with Mt. Hood shining!